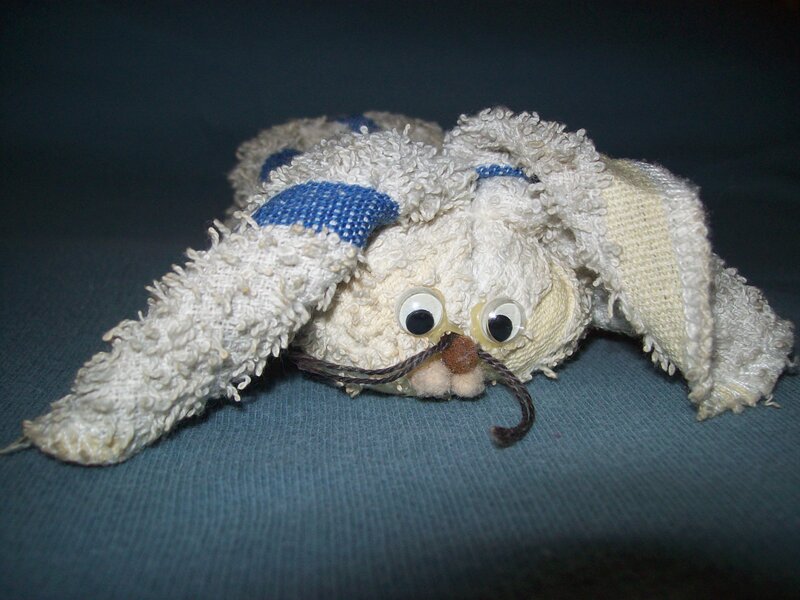 I created Boo-boo bunny as a sample project for a women’s ministry event many years ago. At that time he was white with blue and yellow stripes, bright and clean, and his ears perked up as if he were actually listening for any sound of a cry for help. For that was what he was created for, this was to be his purpose, to ease the pain of someone’s boo-boo. 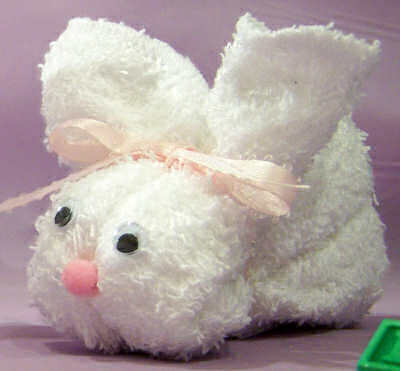 Boo-Boo Bunny was made simply with a dish cloth, some string, jiggly eyes, a bit of embroidery floss for whiskers, and a few tiny pom-poms to give him a nose, a tail, and those cute bunny jaws. All put together, he was quite cute. There is a split section in his body that is just the size to hold an ice cube. That is where his soothing characteristic comes into play. With ice cube held nicely in place, the bunny is ready to rest on someone’s scrape or cut and give cooling relief. He’s been sitting on top of my refrigerator for years. He is on duty and ready to give aid and has done so on many occasions, especially for the grandkids. My three grandchildren are rough and ready kind of youngsters. They climb trees, swing on ropes, skate and scooter and bike. They have had their share of bumps and bruises. Just the other day, Ethan fell on the driveway, scraping his thumb and causing a bruise under the nail. It looked painful. I placed an ice cube in the bunny’s tummy and offered him to Ethan. He placed the ice-cube-in-tummy on his sore thumb and sat on the porch steps. After awhile, the pain was eased, and Ethan was back to his play. By now Boo-Boo-Bunny is bedraggled looking because he has been a busy bunny. He is a bit stained. His ears don’t stand up anymore but instead droop down permanently. He has seen the sad side of life. We only bring him down from the fridge when there is a painful crisis where his services are needed. What if we were put on this earth to bring healing and comfort to other people? Maybe we are. Don’t we too often, however, think about ourselves and “what’s in it for me?” Instead of promoting ourselves, grasping for our pot of gold, concentrating on getting in on good life (whatever that may be), what if we looked for ways to sooth the troubled soul, to listen to a stranger, to offer a cup of tea and comfort, to weep with those who weep? Perhaps our world would be a little bit better if we were less centered on ourselves, sort of like the contestants on TV talent shows who are sure they are the ones worth one million dollars. Maybe we should be more like a little rag bunny whose only purpose in life is to give aid and comfort to the hurting. Max Lucado said it well in his book, It’s Not About Me. What “if we played the music the Maestro gave us to play . . . made His song our highest priority?” And what is the Maestro’s highest priority? What we do for others, we do for Jesus, and He is taking notice of our Boo-Boo-Bunny actions. Do you have a Boo-Boo Bunny at your house? Would you like to? Visit this link and learn how to make one. That is the sweetest thing! I am going to have to make one of these once I have grandchildren. I bet you are the best grandma that ever was!